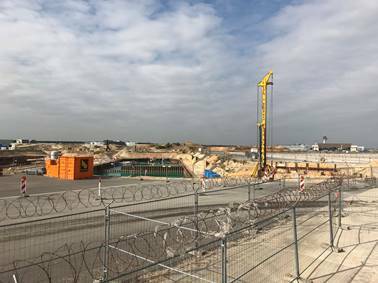 The future Terminal 3 at Frankfurt Airport is one of the largest privately funded construction projects underway in Europe. Currently, the site comprises a huge excavated hole where the foundations for the central terminal building are being laid. Fraport’s visitor service team has responded to enormous public interest in the project by launching a Maxi Tour that focuses on Terminal 3. The highpoint of the 90-minute bus ride around Frankfurt Airport’s apron is a stop at a platform with a fantastic view of the construction site. The Terminal 3 excursion also showcases other fascinating aspects of apron and airfield activities. For example, participants experience takeoffs and landings from close-up at the Center and South Runways. A guide is present throughout, relating fascinating facts and figures, including insights into the construction project. Terminal 3 is scheduled to open in 2023. It will include three new piers, with capacity for more than 20 million passengers annually, and will be setting new standards in terms of its architectural design. Due to safety regulations, participants in the Terminal 3 tour must be at least 16 years of age. The price per person is 15 euros. The tour can be booked for individuals or groups. An ideal addition is a visit to the viewing platform in Terminal 2. The platform is open all year round. More information on other tours and the Visitors’ Terrace can be found at www.fra-tours.com .